If a message comes from Application 1, please send it to Web Service A in Server X, if it comes from Application 2, please send it to Web Service A in Server Y, so on and so forth. What are the purposes of having this requirement? We have numbers of projects which may be developed in different development servers but for the BizTalk parts, they are all deployed in a single BizTalk Development box. 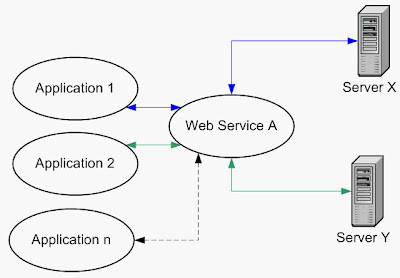 When we're calling the a particular web services, it is possible that Project A will use Development Server A and Project B will use Development Server B. For Load management purpose, we can point Application 1 calls to Web Server A and other Application calls to Web Server B. To solve the namespace and schema issue, we can create a common orchestration which can be shared / called by the applications. But wait, there's only 1 send port can be defined in this solution, we still want Application 1 to call Web Services A in Server X and Application 2 to call Web Services A in Server Y. Now, this is where Role Link comes to play. 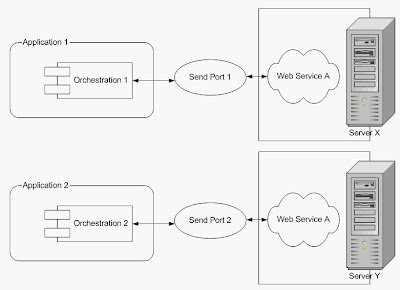 If you see the diagram below, between the Orchestration and the send ports, there is a Role Link Provider. This is just like an additional routing layer which we can use instead of correlating the orchestration and the send port directly. 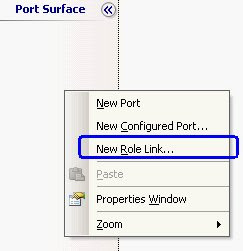 How to use Role Link is quite similar to regular Send port, you may notice when clicking on the port surface, there is New Role Link option ;) and you will need to choose between Provider & Consumer which is basically to define whether you will be sending message through this port or receiving message through this port. The next question will be how to route the message? We create new Party with the Organization name that we define, e.g : Application 1, Application 2, etc. How to check whether the party exists? Excellent description of various scenarios.